Looking for some colour inspiration for a glass splashback for your kitchen or bathroom that works well with your existing decor? Click and drag inside the colour picker below to change the colour of the glass kitchen splashback. We realise that not everyone's kitchen is this particular style and will be adding a variety of new kitchen styles to this page soon. 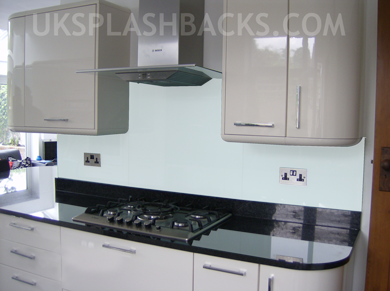 Call us now on 0800 2321149 to arrange a free, no obligation home visit where one of our team can show you some glass samples and help you to create your ideal splashback. This page has been tested in the following browsers; IE7+, Firefox 3+, Opera 9+, Google Chrome, Safari. IE6 doesn't work 100%. If you are having trouble viewing this page, please consider upgrading your browser, where possible, to one of those tested. You can copy the link below into an email or on to your Desktop or simply bookmark it to keep as a reference of your favourite splashback colours.